Around 1/3 of crashes involving provisional drivers are caused by choosing gaps that are too small and result in collision. The advice here are not hard and fast rules but guidelines to help as you build your gap selection skills. What is a safe gap? Safe gap = turning, overtaking, changing lanes, and crossing intersections without endangering road users or causing collision. No one should need evasive action (changing lanes or heavy braking). Safe gaps vary with the speed of the traffic and road and weather conditions. A key hazard perception skill is selecting a gap for you to safely complete the turn. This is often difficult, as you need to watch for road users to the front, left and right. Left turns are sharper than right turns and may take longer. You also need time to accelerate to match the speed of the traffic (higher speed = more time). This 6-second gap needs to be a judgment, as you can’t count it out when you need to make the turn. The 6-second gap will be the same for different speeds, but the distance won’t be. At 60km/h it’s roughly 100m and at 80km/h the gap increases to 135m. This is a guideline and it’s important to develop these skills when driving. Right turns are more complicated than left turns because you need to look for road users in multiple directions. 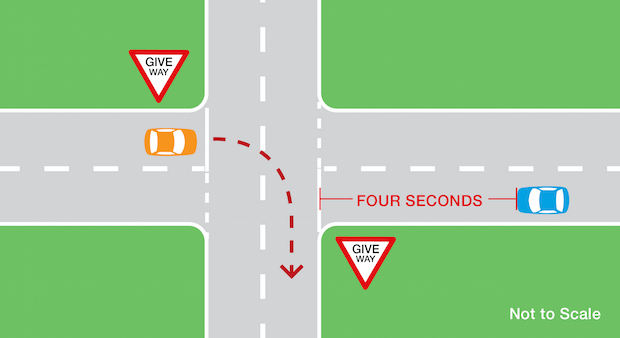 Right turns require you to cover more road but are generally less sharp than left turns meaning you can accelerate quickly to match the speed of the traffic. You will quickly clear the traffic from the right, hence the smaller gap. 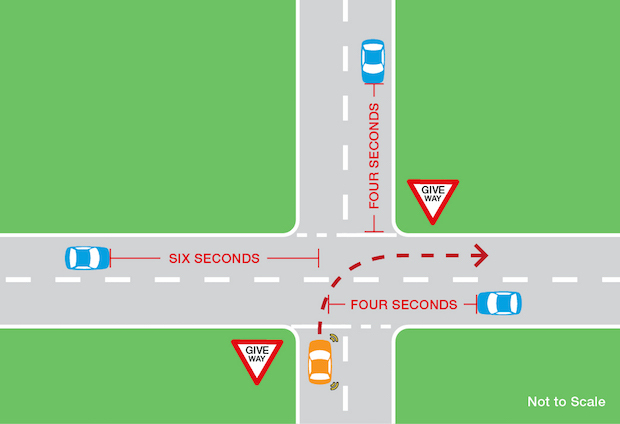 You need time to complete the turn (3 seconds) and accelerate to the speed of traffic (3 seconds) on the far side of the road, hence the 6-second gap to the left. Practice these more complex situations when you have built confidence with simpler gap selections. This is simpler than uncontrolled intersections as you only need to look for a gap in oncoming traffic. However, many provisional drivers pick gaps that are too small or misjudge the speed of traffic. Assuming a 60km/h zone and traffic is actually travelling at 60km/h you need a 4-second (70m) gap to oncoming vehicles. U-turns fall just outside the 5 most common crash types. U-turns are more difficult than right turns. You must look for traffic approaching from behind and in front. U-turns are sharper than right turns and require more road to complete. U-turns are tight turns often from a stationary position. Generally, you can’t accelerate until you have completed the turn and require a large gap to get up to the speed of traffic. U-turns are dangerous and should be avoided unless necessary. A better option is to turn into a side street, do a three-point turn and rejoin traffic in the right direction. You may need less if you don’t come to a complete stop but if in doubt, stop when you’re sure you have a safe gap. A median strip may allow you to cross the intersection in two stages. Select a safe gap to the right and move to the middle of the road. Complete the crossing when there is a safe gap to the left. Head-on collisions are often severe as the speed of the two vehicles combines (e.g. two 60km/h cars colliding = one 120km/h car hitting a stationary object). When overtaking you need enough space to avoid colliding with the vehicle you’re overtaking and oncoming traffic. It is similar to passing vehicles on highways but more dangerous as you must cross the centre line into oncoming traffic. Overtaking is usually done to maintain your speed, though the decision is your own. The best thing to remember is not to overtake unless you have to (e.g. to pass stationary or broken down vehicles). It is difficult to accurately judge if the gap you take is large enough to safely overtake a vehicle. Overtaking is particularly hazardous when your view of oncoming traffic is blocked (e.g. by a truck or bus). Choosing a safe gap and executing the manoeuvre safely is difficult and many provisional drivers have little experience. You should start practice on multi-lane roads so you can learn what a safe overtaking gap looks like. If you don’t feel confident about overtaking, don’t do it. Do not exceed the speed limit to overtake. Whenever possible, you should wait for regular overtaking lanes (signposted in advance) to overtake slow traffic. 1. What is the HPT?